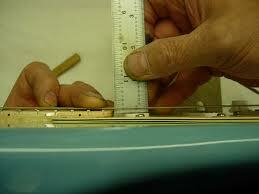 After adjusting the action and string height, you should adjust the height of the pickups. If the pickups are too close to the strings, the magnetic field can cause undesirable distortion.Another by-product of a pickup being too close to the strings is that it can kill your sustain. The strong magnetic field will pull on the string causing it to stop vibrating prematurely. When checking the distance between the pickup and the string, always do so with the string pushed down at the last fret (the fret closest to the pickup). This is where the string will be the closest to the pickup. This is when you make your measurements and settings. Measure from the top of the pickup to the bottom of the string. Different companies have different height recommendations. Gibson says that the neck pickup should have a height of 3/32″ on the bass and treble sides. The bridge pickup should have a height of 1/16″ on the bass and treble sides. Texas Specials: Neck pickup, 8/64″ (1/8″) on the bass and treble sides. Bridge pickup, 6/64″ (3/32″) on the bass and treble sides. Vintage Style: Neck pickup, 6/64″ (3/32″) on the bass and treble sides. Bridge pickup, 5/64″ on the bass and treble sides. Amer/Mex std: Neck pickup, 5/64″ on the bass and treble sides. Bridge pickup, 4/64″ (1/16″) on the bass and treble sides. Humbuckers: Neck pickup, 4/64″ (1/16″) on the bass and treble sides, both pickups. Lace Sensors: As close as desired, allowing for string vibration. You can also use the pickup height to adjust the volume. To do this, just move the pickup closer to the strings to make it louder (be sure it doesn’t get too close or hit the string), and further away to make it softer. You can also adjust the tone with your pickups. 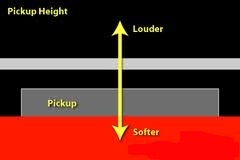 For example, if there is too much bass, you can lower the bass side of the pickup a bit to lessen the low end. If there is too much treble, you can lower the treble side. Experiment with this until you get what you feel is the perfect setting. If you were to set both pickups to the exact same height, the neck pickup will almost always be louder than the bridge pickup. If you want to even the volume out, you can move the neck pickup lower than the bridge pickup. Also, when you have both pickups selected simultaneously, you can adjust the tone by changing the heights of the two pickups so that the mix is better balanced. This all has to do with personal preference. You should set them to what sounds pleasing to your ear, not always to what someone else tells you to. The manufacturer’s specs are merely starting points. Don’t imagine they are set in stone. Some pickups have individual posts in them for adjusting the height for each string. This makes your job harder, but also gives you better control. With this type you should start with all pole pieces screwed down flat against the pickup and make your adjustments from there. If you have single coil pickups, you need to keep the heights lower than on humbuckers because the magnets are usually much stronger. 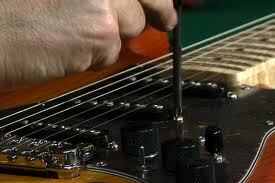 Prior to beginning your setup,you might want to be sure that the pickups are not too close to the strings. This could cause unwanted noises or even pull the string down against it. Because the bass string is larger, the pickup’s magnetic pull is much stronger on this side. So it stands to reason that the bass side of the pickup should be lower than the treble side. It will take some experimentation to arrive at the perfect balance of tone and volume, but it is time well spent. Note: The strong magnets used in single coil pickups can cause sharp intonation if they are positioned too close to the strings. They will pull the strings down, so be sure that they aren’t too close to the strings. While making adjustments, check the tone frequently. And if you get a harsh type of distortion from your guitar, try lowering the pickups a little to get a smoother, more natural type of distortion. The key here is to experiment. The more you play with it, the easier it is to get what you are looking for. Well, by now you should know your guitar a little better and with each time you do it, you will become faster and more proficient at it. I hope that this lesson on setting up your guitar was helpful. I appreciate all feedback. No one is perfect and if I forgot something, please feel free to let me know.